These egg noodles are tossed in one delicious tuna cream sauce! French fried onion chips and cheese make a great addition as there’re broiled until melty and crunchy. 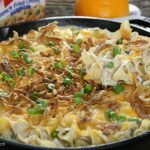 Tuna fish flakes is a great way to incorporate fish into a meal especially for those kiddos who may not be that big of fish eaters. Not only is this recipe a great way to use up some of your pantry items and incorporate some veggies and fish into your meal, but this happens to be an incredibly easy and tasty meal. My little boys finished up there portions with this stuff! This could also be a very versatile meal, as you can use any short pasta for the egg noodles and potato chips for the french fried onion pieces, whatever you think will work as a great substitute for ingredients that you may not have on hand, so feel free to work on your creativity because you never know what you can create:) However don’t stray to much with creativity and substitutions because this version is one tasty one. 1. Cook noodles according to the package directions; drain and toss in a few tbsp of oil to prevent pasta from sticking. Cover and set aside. 2. In a medium saucepan sauté the onion in 2 tbsp of oil until browned. Then add the canned mushroom soup, sour cream, milk, tuna fish and peas; whisk everything over medium heat and bring to a simmer. Add salt and pepper to taste and remove from heat. 3. Place egg noodles into an oven safe dish and pour the sauce over the noodles. Sprinkle with cheese and french onion chips and broil over low heat until cheese melts and chips brown. Cook noodles according to the package directions; drain and toss in a few tbsp of oil to prevent pasta from sticking. Cover and set aside. In a medium saucepan sauté the onion in 2 tbsp of oil until browned. Then add the canned mushroom soup, sour cream, milk, tuna fish and peas; whisk everything over medium heat and bring to a simmer. Add salt and pepper to taste and remove from heat. Place egg noodles into an oven safe dish and pour the sauce over the noodles. Sprinkle with cheese and french onion chips and broil over low heat until cheese melts and chips brown.